Located in Sukhumvit area, Armoni Hotel Sukhumvit 11 is 650 metres from Terminal 21 Shopping Mall. It offers air-conditioned rooms with free WiFi in all areas. The property features a 24-hour front desk. The property is 160 metres from Nana and Asoke BTS Skytrain Stationsas and 800 metres from Sukhumvit MRT Subway Station. It is a 40-minute drive from Suvarnabhumi International Airport. Rooms are fitted with a flat-screen cable/satellite TV, minibar and electric kettle. They also come with a safety deposit box and en suite bathroom. For guests’ convenience, the property provides laundry service. 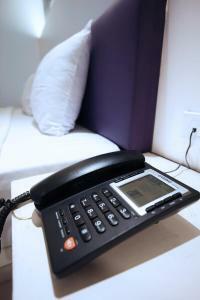 Air-conditioned rooms are fitted with a flat-screen cable/satellite TV, minibar and electric kettle. They also come with a safety deposit box and en suite bathroom. Rate: THB 1159.20 ... THB 2160.00; select dates below to get current rates. Larger air-conditioned rooms are fitted with a flat-screen cable/satellite TV, minibar and electric kettle. They also come with a safety deposit box and en suite bathroom. Rate: THB 1359.40 ... THB 2068.62; select dates below to get current rates. Larger air-conditioned rooms are fitted with a flat-screen cable and satellite TV, minibar and electric kettle. They also come with a safety deposit box and en suite bathroom.